There appears to be agreement among many commentators that 2016 will be another tough year for the steelmaking industry, with demand for the alloy poised to decline further as growth in the world’s major economies, including China, continues to slow and Chinese exports continue to penetrate foreign markets, dragging prices down. Locally, steel construction industry representative organisation the Southern African Institute of Steel Construction CEO Paolo Trinchero predicts that the steel construction industry will survive 2016, owing to several years of resilience and persistence by local steel fabrication companies through challenging times. He add, however, that large-scale stimulation is needed to grow the South African steel industry and market, as the industry has recently been fulfilling only small orders for various projects as a means of simply obtaining work and surviving. 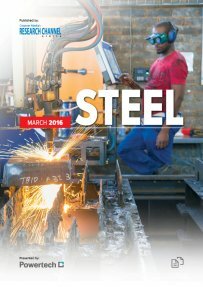 Creamer Media’s Steel 2016 Report examines South Africa’s steel industry over the past 12 months. The report provides insight into the global steel market and and particularly into South South Africa’s steel sector, including production and consumption, main producers and a brief overview of the stainless steel market. This report draws from material published over the past 12 months and is a summary of other sources of information published in Engineering News and Mining Weekly, as well as of information available in the public domain. This report does not purport to provide an analysis of market trends. Published on: 01 March 2016.